Great drumsolo from Tim Keiper and surf-rock solo from Shanir Blumenkranz. Cyro Baptista’s Banquet of the Spirits at Vrije Geluiden recording. Made with my digital cam. Unfortunately this part fell off during the editing but it’s very worth a while to share it. 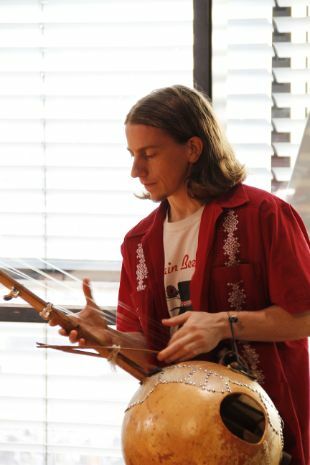 About Tim Keiper: TIM met Cyro Baptista in New York City in 1999 and soon after, joined Beat the Donkey. Since then, realizing that music is the only way to live, Tim has focused on touring, recording, and making instruments. He has worked with Anthony Braxton, John Zorn, Andrew D’Angelo, Reid Anderson, Erik Friedlander, and hasidic reggae artist Matisyahu. 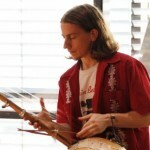 Besides touring with Beat the Donkey, Tim has toured extensively with Skeleton Key, Caveman, and The Dirty Projectors. In the fall, Tim worked with Africa empowerment organization Modiba Productions on a father/son recording by Mali blues guitarist Ali Farka Toure and his son Vieux Farka Toure. Also, Tim made his film debut in Julie Taymor’s new film, a Beatles musical called Across The Universe.